Cairo (Egypt) – June 20, 2018 (travelindex.com) – Positive outlook for Egyptian Tourism in the second half of 2018 to 2019, local tour operator see increasing of foreign visitors for Egypt Western Desert tour and eco-tourism. Renowned for its rich in culture and history dated back 4,000 years of Pharaoh and Pyramids, Egypt country also has a lot more to offer – a paradise on earth and magic of Egypt Western Desert. “All visitors who experienced Egypt western desert have been impressed with stunning view of Sahara desert, golden sand dunes, campfire at night, local Egyptian and Bedouin food, swimming in hot spring, fun sand boarding etc. In the White desert, we can see fossil of seashell that prove the area was once be sea and watery area. 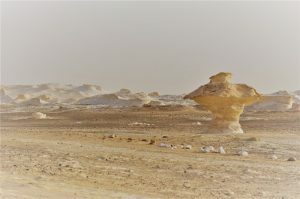 With these amazing nature and different scenery of each area, plus professional desert tour service, we have welcomed several of repeated visitors,” said Loly. With 21 years of experience, we come from one of the oldest Bedouin families who support us with all the secrets of the ancient and historical Western Desert. We are the best team and with the professional equipment and supplies in order to clients feel comfortable. The cars are all 4X4 and the drivers are professionals! So, QUALITY is the word that describes our tours and we will always do our best to continuing be the FIRST ONE in this field.